Patients with missing teeth who also want or need to bring their smiles into the correct alignment may need to get both braces and dental implants. In such cases, the patient’s specific needs will determine the order in which those treatments are provided. Placing implants after orthodontic work is completed is the most common method of treatment. There are several reasons for this. 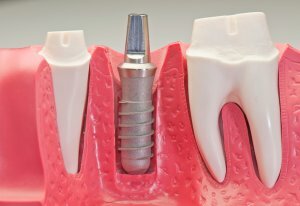 First and most importantly, dental implants can not move once placed in the jaw and osseointegration has taken place. Unlike natural teeth, they will not move in response to orthodontic treatment. So if the teeth around the implant need to be moved, it is better to have the implant placed after all the surrounding teeth are in the correct position. In some cases, orthodontic work must be done to make room for the implants. In this case, it will also be necessary to complete the orthodontic work before the implant surgery is performed. Once your braces are removed, you will have plenty of room for your implant and can enjoy a perfect smile again. There are some circumstances in which it is better to have your dental implants placed before you get your braces. Your orthodontist will work with the oral surgeon to determine which is the better option for your personal situation. Implants can be placed before braces if the teeth that will be realigned are not near the teeth that will be replaced. For example, if you will have braces only on your front teeth but are missing a molar, the molar can be replaced with an implant before the orthodontic treatment begins. In other cases, an orthodontist will use an implant as part of the orthodontic work. Because the implant will not move, it can be used to anchor your braces and help provide better results. If your orthodontist has recommended an oral surgery consult for dental implants, please call Prestige Oral Surgery to schedule an evaluation at 732-297-7000.